Golf Community Reviews is committed to protecting your privacy and providing you with timely information and observations in a safe online environment. Registration at the site is not required in order to view our content, but an email address may be required for you to leave a comment at the site or benefit from additional services (such as personalized advice regarding golf communities). Although from time to time Golf Community Reviews may share information with our readers via email that we believe is in their interest, you can opt out at any time with email notification to editor@homeonthecourse.com. 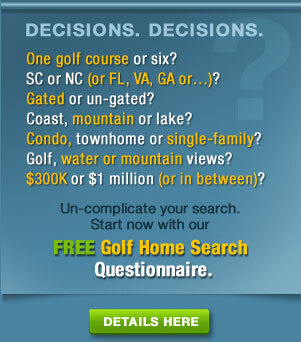 Golf Community Reviews does not sell, rent or lease its reader lists to third parties. The opinions expressed at Golf Community Reviews are solely those of its editor except in the clearly delineated “Comments” sections that immediate follow individual articles, where readers are invited to share their own observations. Prior to posting a contribution from a reader, the editor reserves the right to reject any comments that do not meet the standards of good taste and relevance or to edit acceptable comments for space limitations reasons or to enhance their relevance. As part of our service, we provide links to other web sites that we believe provide valuable and related information. We encourage you to check these sites’ own privacy statements to ensure they meet our high standards and your own. Understand that these sites may require you to register and provide personally identifiable information. Golf Community Reviews and HomeOnTheCourse LLC are not responsible for the content or operations of any web sites other than our own, including those who advertise on our site. Most advertising on our site is randomly generated. That is, Google and other “packagers” of advertising post ads on our site over which we have little or no practical control. We encourage our readers to exercise the same kind of caution they would in purchasing any product or service on the Internet. We are not responsible for the claims or conduct of any advertiser. We are not liable for nor responsible for any loss or damage you may suffer as a result of your dealings with any advertiser or because of an advertisement on our web site. We do not collect routinely any personal information about our readers. However, from time to time, we might either post surveys at our web site or send an email asking our registered readers for information that will help us enhance the content and design of our web site. Any personal information we collect will NEVER be shared with any other parties. As a matter of good business practice, we collect general statistics regarding traffic to our site, but none of it provides personally identifiable data about our readers. This general data is used to customize and refine our content and to provide information required by advertisers. Golf Community Reviews secures your personal information from unauthorized access, use or disclosure. Our computer servers are operated in a controlled, secure environment, protected from unauthorized access, use or disclosure. The editor welcomes your comments regarding this Statement of Privacy. If you believe we have not lived up to the standards we have set in this statement, please contact us at editor@homeonthecourse.com and we will address your concerns.